Have you ever had a dry bean crop that looked healthy but resulted in disappointing yields? Have you seen stunted or yellowing patches, but could not identify the cause? 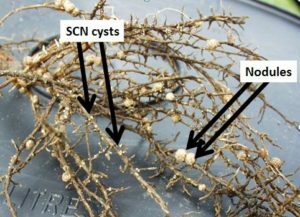 If so, you may want to look for soybean cyst nematode (SCN). 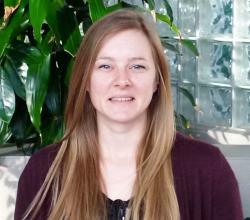 Researchers in Ontario and the US have shown that SCN is not just a soybean pest, it also reproduces on dry beans. SCN saps nutrients from the plant and can restrict root growth. There may or may not be visible above ground symptoms when beans are infected with SCN. The impact of SCN on dry beans depends on the market class, and may also depend on the specific variety. 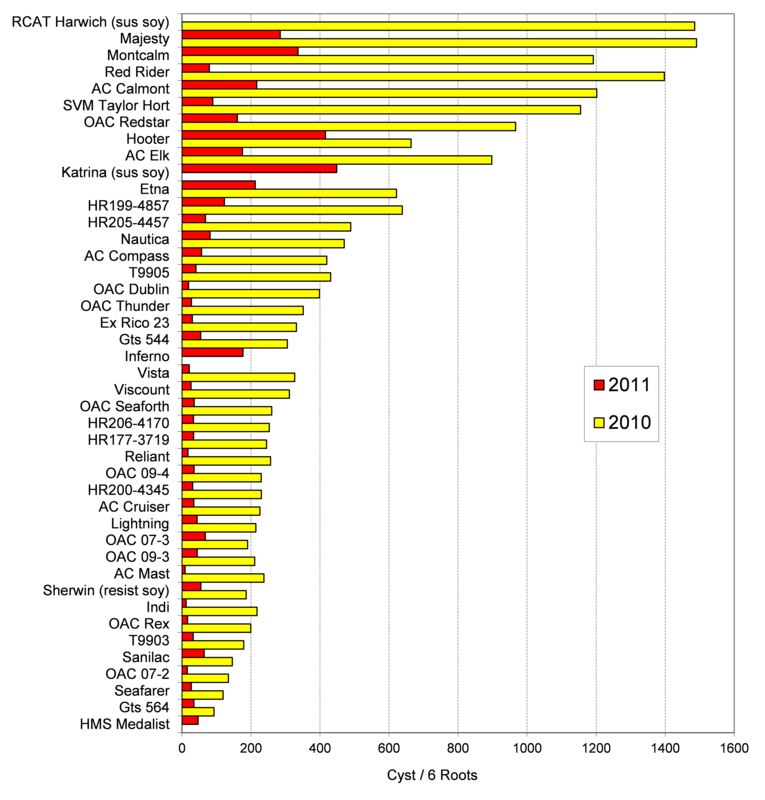 AAFC researchers planted 40 dry bean varieties in SCN infested fields in 2010-2011, and about half had cyst counts similar to the SCN-susceptible soybean variety. These included cranberry, dark red kidney, and white bean varieties. Other trials have shown that adzuki beans are very susceptible to SCN, more so than susceptible soybeans. 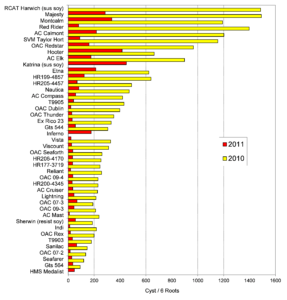 Range of SCN reproduction on roots of different dry bean market classes and varieties (T. Welacky and A. Navabi, AAFC). There was significant variation in 201 compared to 2011. Approximately 50% of the dry bean types had cyst counts similar to SCN-resistant soybean variety Sherwin. In studies conducted at North Dakota State University using 24 varieties (white, black, kidney and pinto), SCN developed normally on all classes and varieties of beans. Kidney beans had high numbers of female cysts, similar to susceptible soybeans. SCN reproduction was lowest on black beans. The different white bean varieties had a wide range of female SCN counts, but within the other classes of beans there were no differences across varieties. SCN-inoculated bean seedlings (one variety each of pinto, white and kidney) were also assessed in field conditions and taken to yield. Up to 56% reduction in seed weight of SCN treated pinto beans was observed compared to non-inoculated controls, and up to 37% and 31% for the white and kidney beans, respectively, although losses were not recorded at all locations. In general, kidney beans appear to be as susceptible to SCN as soybeans are, and adzuki are more susceptible. Black and white beans appear to be less affected by SCN than other bean types, although studies show variability across white bean varieties and few studies have been taken to yield. Cranberry beans have not been extensively studied to date. SCN is known to be present across southern Ontario, as well as in parts of central and eastern Ontario, which includes the regions where dry beans are grown. Producers should soil sample fields to determine their risk of yield loss. Soil samples taken for fertility can be split and submitted to labs for SCN assessment. In August, carefully dig up plant roots and look for small pearl white or yellow cysts. The cysts will be smaller than nodules on the roots; you may need a handheld magnifying glass. Management will include lengthening rotations and choosing a market class than can perform under SCN infection, and research is currently being conducted at the University of Guelph on the efficacy of seed treatments. SCN resistant dry bean varieties are currently not available.